A brief note to say thank you for your excellent treatment after only one year I feel better than I ever have before. I suffered from various illnesses throughout my almost 50 years. In my childhood and well into adulthood there were many migraines and headaches. Then there were constant ear nose and throat infections in my late 20's and early 30's together with the migraines. This was followed by neck, shoulder and back pain and sore hips. In my early 40's I started to get strange internal infections ( e.g. intestine, thyroid and others) which left me quite nauseous and drained. My health had completely gotten out of balance and the western medicine well let's just say it reached its limits very fast. In an effort to better my health I saw general GP's, specialists, homeopath, naturopath and even followed strict eating regimes... Sometime I would feel a little better but overall any improvements were short - lived. Then I come to see you Dr. Maria and I could feel slight improvements. Despite our language barrier ( Chinese/ German ) you are able tjo communicate clearly and logically what is going on before, during and after the treatment. Thank you for providing such great treatment & acupuncture. It is fantastic to have a straightforward treatment - no crazy believes or diets, and no treatment unless it is actually required. THANK YOU SO MUCH DR. MARIA I HAVE NEVER FELT BETTER IN MY WHOLE LIFE! Over the years I had heard just about everything when my advisers got to the end of their healing ability. My illness was then made out to be not all that bad - just get on with it, or it was all in my head, laziness or something else. But what a difference your treatment has made to not just my life but also for my family and friends. Dr. Maria you saw how I was quite run down... a little more than just not wanting to go to work that day. But now finally ! I look in the mirror and I can see my hair bounce, my skin looking good and most of all no more strange illnesses or being nauseous. No more shakiness behind the eyes or having to cancel appointments due to being unwell. I can just get on with life doing good and being active. And when my family and friends tell me that I look good I always send a blessing your way Dr. Maria. It was only through your expert advice and knowledge that I am feeling so much better now. Word can not sum this up, thank you. I just wanted to thank you so much for all you have done for me over the past few months. When I came to see you in April, I had been in severe and excruciating pain for a year. Even though I had sought the advice of many specialists, doctors and other health professionals, no one had been able to help me, diagnose my problem, or even suggest a possible answer. I was in agony and my life seemed over. However, through your great expertise and experience you quickly diagnosed my problem and within a few short weeks not only did I have my life back, I had an answer to my woes as well as treatment! The treatment has been so successful that I cannot believe the relief, and I am now well on the way to a complete recovery. I shall never forget that day in April when I passed by your Clinic and decided to turn in and ask for help – it really was my lucky day, and the care and treatment you have given me are nothing short of a miracle! And so I thank you so much for giving me my life back, for all your kindness and most especially for your wonderful knowledge, expertise and treatment. "When I first went to see Maria at the Eastern Healing Centre I had no idea what was wrong with me but was becoming desperate to find out how I could get better. I had been to my GP, a colon cleansing clinic, read all sorts of books, tried different diets and nothing worked for long, if at all. After my first session with Maria I felt there was some hope. I was so amazed with what she was able to tell me about my overall health that I became fascinated with how she could know these things. 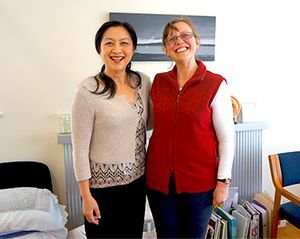 She tells me it is the ancient way of Chinese medicine which has been known for thousands of years-and I believe it because it has worked for me. After just a few weeks of taking the Chinese herbs prescribed by Maria I am a new person. I have lost weight, without cutting down on my food, I am able to sleep throughout the night, something I haven’t been able to do for nearly ten years, and stopped my asthma medication which I had been on for most of my life.. I feel so much healthier and have a new lease on life. And so much more energy. Thank you for seeing me about my asthma. The ‘tea’ you gave me smelled nicer than Alisons’ and has done amazing things to me! I can breathe properly for the first time in weeks! So I need to come and see you again and have a check up. Also Alison wants another appointment with you too.